Tuesday's with Morrie is without a doubt one of my favourite books, quite possibly getting the number one spot so I was looking forwards to reading this short book of Morrie's wisdom and life lessons. 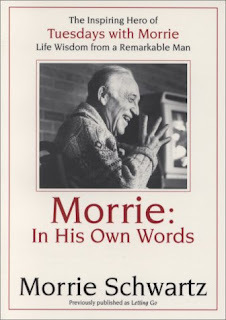 I was expecting a wide range of views on different subjects much like what appears in Tuesday's with Morrie however what I found was more of a guide to living with a terminal illness. Don't get me wrong there's some lovely thoughts in it but it wasn't quite what I was expecting and didn't have the impact of Tuesday's with Morrie because it was much less relevant to me. It's a fairly short book and pretty quick to read due to the layout. I'd see give it a go if you've read Tuesday's with Morrie but don't expect the same amount of profound wisdom on a range of topics.